There was not an authentic Code of Chivalry as such. The Code of Chivalry was a moral system which went beyond rules of combat and introduced the concept of Chivalrous conduct - qualities idealized by the Medieval knights such as bravery, courtesy, honor and great gallantry toward women. The Codes of chivalry also incorporated the notion of courtly love. The Code of Chivalry was the honor code of the knight. The Code of Chivalry was an important part of the society and lives of people who lived during the Medieval times and was understood by all. A knight was expected to have not only the strength and skills to face combat in the violent era of the Middle Ages but was also expected to temper this aggressive side with a chivalrous side to his nature. 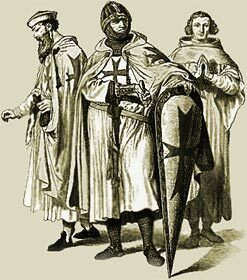 The ideals described in the Code of Chivalry were emphasised by the oaths and vows that were sworn in the Knighthood ceremonies of the Middle Ages and the Medieval era. These sacred oaths of combat were combined with the ideals of chivalry and with strict rules of etiquette and codes of conduct towards women. The virtues taken as a Knight's Code of Chivalry was publicised in the poems, ballads and literary works of Medieval authors. The wandering minstrels sang these ballads and poems which described the valour and the code of chivalry followed by the Medieval knights. The Dark Age myths and legends featuring King Arthur and the Knights of the Round Table further strengthen the idea of a Code of Chivalry. The Arthurian legend revolves around the Code of Chivalry which was adhered to by the Knights of the Round Table - Honour, Honesty, Valour and Loyalty. Of the seventeen entries in the Code of Chivalry described in the Song of Roland, at least twelve of the codes relate to acts of chivalry as opposed to acts of combat. The above virtues are featured in the Code of Chivalry as described by the Duke of Burgandy. The Medieval Times website provides interesting facts, history and information about knights of old which scatter the Medieval History books including the subject of Code of Chivalry. The Medieval Times Sitemap provides full details of all of the information and facts about the fascinating subject of the lives of the people who lived during the historical period of the Middle Ages. The content of this article on Medieval life and times provides free educational details, facts and information for reference and research for schools, colleges and homework for history courses and history coursework.